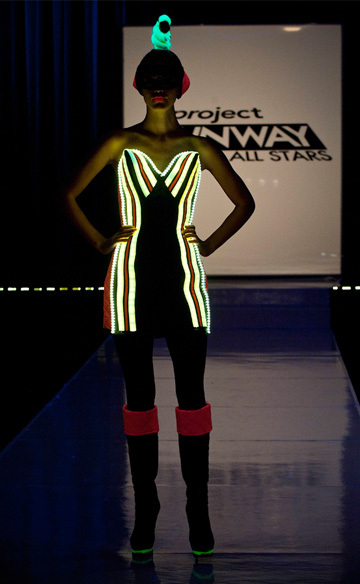 Did one of last night’s technology-inspired designs on Project Runway All Stars make you light up inside? I take my favorite look of the night off the screen and make it wearable so you can steal the look. My favorite look of the night? Mondo’s strong and powerful black and neon dress. The designers needed to design a look that would literally light up the black-lit runway. While Mondo didn’t win the challenge, his was one of the only complete looks you could actually wear on a night out. The design screamed “independent woman with that touch of fire.” Divine. Fashion tip: As we’ve seen for the past few seasons, fashion is still in a full-on 1980s revival, which means one word… neon. While anyone can pull off this wild color category, you want to make sure you’re not wearing so much neon you look like a crazy raver kid. Touches of neon used to enhance an overall neutral outfit will make you look sophisticated chic, but still fun and fierce. If you’re not necessarily that fashion adventurous, try finding a neutral top or dress that has neon piping (like the look below), rather than a full neon piece that may be too loud for you. Also, a fabulous neon bag with a black dress, or a few bright bracelets with a cool leather jacket will totally make you stand out in the most appropriate way for any occasion.